Boost your system?s performance using the Crucial CT8G3S1339M 8GB Mac Memory Module. This memory module comes with 8GB of DDR3 memory that enables your system to deliver ultra-fast and lightning-speed multitasking operations to your Mac laptop. For easier and faster installations, it is equipped with 204-pin SODIMM interface. What are you waiting for? Speed up and enhance your PC?s performance. 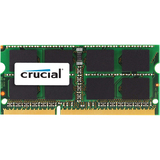 Get the Crucial CT8G3S1339M 8GB Mac Memory Module today!